For someone who has always been bad at math, I have a weird fixation on numbers. Take my mother’s death. Officially my mother died on March 20. A Monday. This is the date on her death certificate and the date on her gravestone. This is also what the staff at the nursing home north of Toronto, where my mother had lived for the past 26 months, told my father when they called him at seven that morning. My mother, they said, had died overnight. I wanted more details, though. “Overnight” felt too nebulous. When my sister, Alexis, and I arrived the next day to retrieve the last of my mother’s possessions, it was the first thing I inquired about. Who exactly had found her? I asked the nursing attendant manning the staff desk that oversaw my mother’s wing, hoping this would lead to the specifics I was searching for. The nurse was an older blond woman, and she seemed puzzled by my question. “When a person is that ill,” she said, “we send someone in to see them every hour.” Behind her on the wall, in the frame reserved for pictures of recently deceased residents, was a picture of my mother. “In loving memory” read the gold-plated plaque nailed to the bottom of the frame. It was a terrible picture, taken recently. My mother’s face was thin and frail, the confusion that had eaten up her mind apparent in the angry, taut expression. It made her look like a stranger. My mother, always so careful with her appearance, would have been horrified by the photo. She wasn’t even wearing lipstick. Still, I tried again. I concentrated on sounding calm — I’d long ago learned this was the best way to deal with medical staff — as if I was just making casual conversation. But the truth was that since the previous morning, when my father and then, minutes later, my sister called to tell me the news, I’d been preoccupied with this small bit of information: I wanted to know the exact minute my mother had died. And barring that, I wanted a time stamp on the last instance they’d seen her alive. I obsessively time-stamped my journals as a child, carefully watching the second hand on my Mickey Mouse alarm clock and then furiously scribbling down the numbers before it ticked on, as if this detail would give more authenticity to my record. I wanted to be able to do the same for my accounting of the end of my mother’s life. It felt like a loose thread in an otherwise perfectly woven tapestry I was trying to reattach correctly. I hadn’t yet shed a single tear. I had a vague sense they were on the horizon, but the tsunami of emotions brought on by her loss wouldn’t reach me for a while yet. In the meantime, I set about constructing a narrative around my mother’s death that made sense, a path I could funnel everything down when grief arrived and tried to wreak havoc on me. So many of the decisions I’d made in my life had been the result of stories I’d read, or heard, or was trying to emulate — there was a safety there, I knew. I also knew there was an irrefutability to numbers that I could rely on to nail everything else down. The number I was looking for that day was 19. The 19th was Maddy’s birthday. Maddy, my oldest friend in New York, the person who for nearly two decades stood in so many times as my unconditional support system, my emergency contact. That my mother would depart the world on the same date Maddy entered it seemed to me a perfect conclusion to the story I was creating for myself about her death. It made sense. I deeply wanted proof from the nursing home staff that it was possible “overnight” meant my mother could have died before midnight and simply hadn’t been found until the 20th. This was my first foray into the house of mirrors that I later came to recognize as the early days of grief, and I was confident I was being entirely rational. But no one knew. As far as the world was concerned, my mother had died, alone in her room. Peacefully in her sleep, as they say. After a lengthy battle with Parkinson’s and 49 years of marriage to my father. My sister and I wrote those lines, in fact, composing her obituary in the car on the way to the funeral home the next afternoon. I dictated sentences from the driver’s seat, and Alexis typed them into her phone and then read them back to me, making corrections and suggestions as she went. It all sounded so normal. Practically comforting. The sort of benign obituary one passes over and thinks: Long life, well-lived, no tragedy here. In the four months since the 2016 election, I’d greeted nearly every reported death of a person over 70 with a sort of mental hat doffing, as if to say, “Good for you. This definitely feels like an excellent time to make an exit.” But now that the person exiting belonged to me, it didn’t feel that way at all. As it turned out, standing by death’s door, no matter how long you may spend there with a person, no matter how comfortable you think you are with its presence, is a great deal different than having that person walk through it. What she had been unable to provide for me as a lived example — fearlessness, adventure, ambition — she made sure I had in abundance in tales. Everything felt like a set of nearly but not quite symmetrical numbers to me that week. At 43, I was one year younger than my mother had been when her own mother died. I’d done the math as I was driving up to Alexis’ house after landing at the airport in Toronto. Even the roads that morning seemed slightly off, which was especially odd since I’d been born here. I grew up traveling these highways to swim meets, to visit relatives, to sneak out to downtown dance clubs. In the past few years, as my mother’s health failed and my visits home increased, I did this drive an average of every six weeks, and yet on this trip, I dimly stared ahead, wondering why it all seemed so strange. It wasn’t until I was halfway home that I realized I was on the wrong highway. I’d taken the wrong exit out of the airport but had no recollection of doing so. This would be the first of many wrong exits I would take off familiar routes over the next few days. More numbers: My mother had been married to my father for 18 years by the time she attended her own mother’s funeral. She had two children, Alexis and me, nine and 11, respectively. She blazed through university, the first in her family to do so. It was my father who insisted we include in my mother’s obituary that she completed two master’s degrees on full academic scholarship and received straight As throughout her education. He had always been just as enamored with her brain as the rest of us. 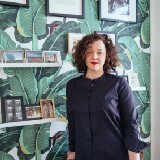 Not long after they married, however, she opted to become a stay-at-home mother. In pictures snapped on our front lawn from the year my grandmother died, my mother looks 43: thoroughly middle-aged, from her overlarge eyeglasses to her taupe wraparound skirt and orthotic shoes. It’s almost as though she had walked out of a museum exhibit about mid-1980s motherhood in the suburbs. She appeared sensible and respectable, someone you would expect to be carting her children around to various activities (in the hulking brown Oldsmobile, visible behind us in many snapshots), rising early to make our breakfast before swim practice and carefully pack lunches, complete with sliced carrots wedged into Tupperware containers holding just enough water to keep them fresh. Which is what she did. She never traveled. She never went anywhere on her own. I can’t remember a single day when she wasn’t waiting for us when we arrived home from school. Always modestly dressed, she never left the house without lipstick on. I appeared to be none of these things. I lived in New York by myself. I had no children. My main mode of transportation was a bicycle, which I wielded through the streets of the city like a weapon. I traveled as much as I could. I enjoyed being alone. I often walked to the corner store in my pajamas (though rarely without lipstick, it’s true). In short, I had not become my mother. Which was not an accident. I loved my mother very much, but the truth — a truth I couldn’t escape even after her death, when the world called on me to create pleasing truths — was that she had never been an example for me. Never been a source of wisdom or guidance. I hadn’t come to her with problems I needed solving. I hadn’t sought her approval. 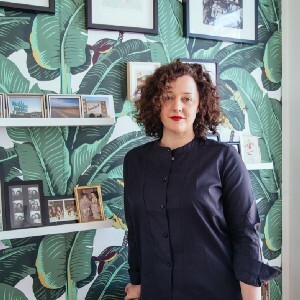 Once, when I was small, four or five at most, a therapist she’d been seeing to deal with her then near-paralyzing agoraphobia — or perhaps it was her claustrophobia; she battled many anxiety-related phobias for most of her life — had told her, “You have a very powerful child there, Mrs. MacNicol.” I loved this anecdote growing up. Even at a young age, I was already marking the gap between my mother and the heroines I liked to read about in books. I was powerful like them! And now I had proof! Only years later did it occur to me that I had been, in part at least, the subject of that visit. That my relentlessness had always been a challenge for her. I had known early on that I did not want my mother’s life. If anything, I actively unwanted it. She must have known this, too, but if it hurt her, she never let on. I was certainly never made to feel bad about it. Instead of filling this gap between us with guilt or anger or fear, she gave me stories. Nearly every night of my childhood, we sat in the living room, where the dog was not allowed to enter, on the white couch my parents had purchased as newlyweds, in a room now reserved for holidays and company (even though we rarely had any of the latter), while she read to me. The Chronicles of Narnia, Little House on the Prairie, The Hobbit, The Lord of the Rings, The Black Stallion, Anne of Green Gables (I was always tasked with reading aloud the chapter where Matthew dies, my mother too choked up to get out the words). Like the blue atlas I continually pulled out of the bookcase to mark Laura Ingalls’ trek across the American Midwest — eventually rubbing off small towns completely with my repeated attention — my mother spent my childhood supplying me with these literary maps of the world. What she had been unable to provide for me as a lived example — fearlessness, adventure, ambition — she made sure I had in abundance in tales. An ever-expanding blueprint for life, doled out to me chapter by chapter, night after night, while she scratched my back with her long, elegant fingers and well-filed nails and read on in her calm, articulate voice. As much as anything my mother did or didn’t do, the lessons learned from those books made me the person I became, often in ways that I’m sure made my mother wish she’d handed me something more practical instead, like a guide to economics, or even a cookbook. These stories directed my entire life. Until they didn’t. As I moved into my forties, single, childless, and now motherless, I began to understand I was living in a land without stories. I had no idea what my life was supposed to look like from here on out, and no one to guide me. I was going to have to create it for myself. 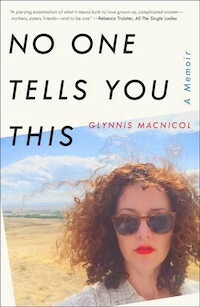 From No One Tells You This: A Memoir by Glynnis MacNicol. Copyright © 2018 by Glynnis MacNicol. Reprinted by permission of Simon & Schuster, Inc.